SACP staff will be out tomorrow assessing the situation and to see if any chassis on terminal were affected. This applies to facilities that are accessible. SCSPA gates reopen tomorrow morning. Vessel operations recommenced today. Rail operations return. Greer reopens tomorrow. Dillon remains closed. NCSPA. The port remains closed through Wednesday Sept 19. A further update will be provided by the port authority by Tuesday at noon. A flash flood emergency is in effect in Charlotte. Heavy rains continue throughout the Southeast. change in strength is expected before the center reaches the coast, with weakening expected after the center moves inland. Winds are expected to first reach tropical storm strength by later this morning or early this afternoon, making outside preparations difficult or dangerous. Preparations to protect life and property should be nearing completion. Storm could impact more of Georgia and Southern S.C. with heavy rains and winds. Western Georgia, South Carolina and North Carolina may see wind/rain impacts not previously anticipated. Current Export Receive Date window will be implemented allowing containers to be delivered onto Garden City Terminal 7 days from the scheduled arrival date of the vessel beginning on Thursday September 13, 2018. 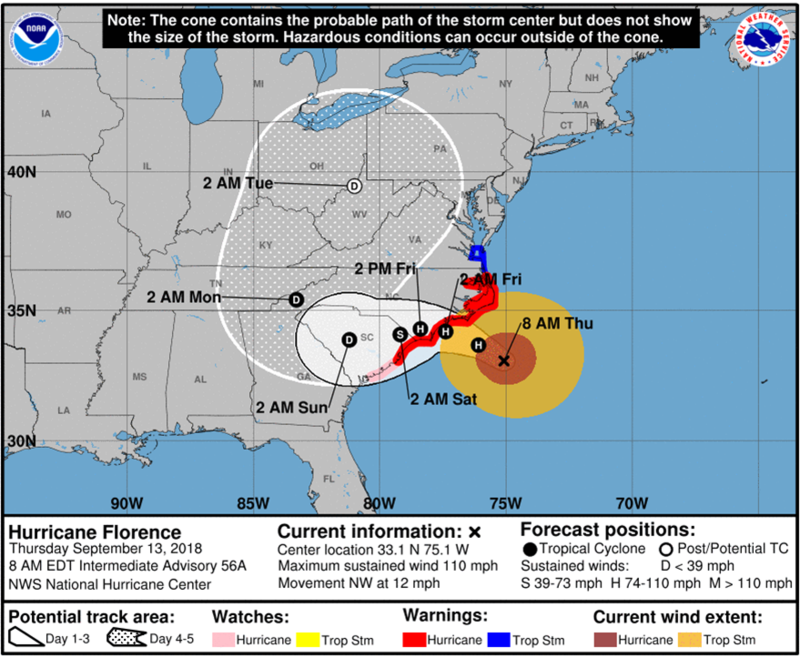 CCM continues to closely monitor Hurricane Florence as it prepared to make landfall in the Southeast sometime on Thursday as a Category 3 or 4 storm. The SACP has been engaged with all potentially impacted chassis pool locations to ensure chassis are placed in protected areas. At this time both Georgia Ports Authority and South Carolina State Ports Authority remain open. SACP is ensuring terminal operators have chassis available while they are operating. M&R vendors are repairing chassis and the chassis pool is continuing to ensure equipment stocks are plentiful until such time as ports determine changes to their operations. Both the Ports of Wilmington & Morehead City will be CLOSED to commercial truck traffic Wednesday, 9/12. After 6:00 pm Tuesday, access will only be granted through Wilmington's South Gate. Currently observing normal operating hours at all facilities. We will continue to monitor the path of the storm, potential closures and communicate with our stakeholders, vendors and tires suppliers in preparation and recovery. More information will be distributed as it becomes available. Currently a category 3 hurricane, will approach coast of South Carolina or North Carolina on Thursday.